One of the most intriguing experiences in science is observing something completely counterintuitive. And then having to figure out, okay, why is everything I thought I knew wrong in this case, and what experimental or theoretical studies can I do that will help explain this? That’s the appeal and the challenge of nanoscience: things at a small scale behave very differently from what we’d guess based on observations at a large scale. So how does weirdness inherent in the quantum world come into play? A single atom has different properties than a bulk material that has trillions of atoms together. That’s because there are a discrete number of possible configurations for the atom to be in, which means discrete energy levels. This is called quantization, as opposed to the continuous smear of available configurations and energy levels that a bulk material has. But if we move away from the extreme cases, where does bulk behavior stop and quantized behavior kick in? Are two atoms still a quantum object? Three? It turns out that quantization of material properties actually persists for awhile, and collections of hundreds or thousands of atoms can still show quantization. So how do we know where the transition point is between bulk and quantized properties? If we think about shrinking a material down, at some point the size of the material will become smaller than the size of the electronic wavefunction in that bulk material. Below that size, the electrons are “confined” and the states available to them start to change depending on the material size. So we can define a length that is a “quantum confinement limit” for each material. Below the limit, the collection of atoms is confined and has quantum properties, and above the limit it’s approximately the same as a bulk material. Once we know that limit, there are several ways to make nanomaterials that have quantized properties. We can make nanostructures that are confined in one dimension, like nanosheets, but bulk-like in the other two. We can also make nanowires, which are confined in two dimensions but have one bulk-like dimension. 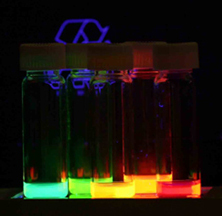 Or, we can make “quantum dots” which are confined in all three dimensions. Quantum dots are like little islands of material, with discrete energy levels just like an atom would have. And one consequence of quantization is that the wavelength of light that quantum dots absorb and emit actually depends on size, as in the image below. Smaller quantum dots absorb and emit bluer light, because the size of the quantum dot increases the spacing between energy levels. There are lots of applications for this effect, such as solar cells whose absorption spectrum is tuned to that of the sun, or LEDs that emit tunably-colored light. But at the nanoscale, the surface of the object is a lot more important. In something macroscale, like a brick, less than 0.0001% of the atoms are on the surface of the object, but in a quantum dot 30% of the atoms may be surface atoms. That makes surfaces very important! And surface atoms can be the sites of electronic defects, or the sites of bonding by various chemical species that change the properties of the quantum dot. So surface chemistry becomes important, and the quantum dot or nanowire or nanosheet may be very sensitive to small changes in the environment. This can be an asset, though, for example to make gas sensors from chemically functionalized nanomaterials. Another consideration is that if a material has some features that are nanoscale, those features may be as small as or even smaller than the wavelength of visible light. Practically speaking, this means it’s often easier to image nano-objects with electrons rather than photons. But again, there’s an upside, because you can tune the nanoscale features to interact with light in specific ways or even be hidden from interactions light. This is one of the most interesting things about metamaterials, which I’ll write more about soon! This entry was posted in Physics and tagged chemistry, nanoscience, physics, quantum dots, scaling, science, size. Bookmark the permalink. You make nanoscience very interesting and available to ordinary folks. Yay, I am glad you think so!